He had minor issues before moving to Alan King’s from Eve Johnson Houghton’s and has benefited from Alan King’s salt chamber. He showed much improved form this year winning at Wolverhampton and placed second. Alan King says he is very much a horse with work in progress and further improvement can be expected. 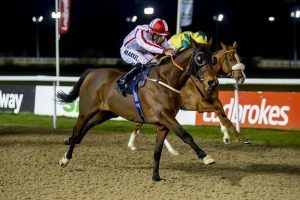 Tour De Paris (Tom Marquand) winning at Wolverhampton 20th February 2019.